What is the easiest way to have a nice dinner with friends immediately ruined? How about being told your expensive Dutch super car just burned itself to the ground while you were enjoying your meal. That is exactly what happened to a German man Thursday night when he returned to his Spyker C8 Spyder after dinner. 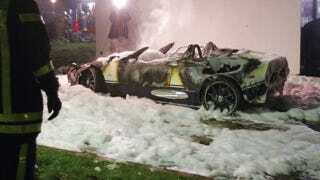 While the former Spyker owner had been eating, the parked car inexplicably set itself on fire. As you can see from the burnt out remains, there wasn't much left of the car by the time firefighters in Großensee, Germany were able to extinguish the blaze. Although the cause remains unknown, the devastated owner of the charred automotive mess told the Hamburger Morgenpost he had recently had the car in the shop to have the battery replaced.